Our extra strength pain relieving spray works quickly to provide fast, temporary relief of everyday arthritis, muscle and back pain. Get the proven pain-relieving benefits of menthol, plus glucosamine and MSM – two essential ingredients long known for their ability to help with joint pain and arthritis. 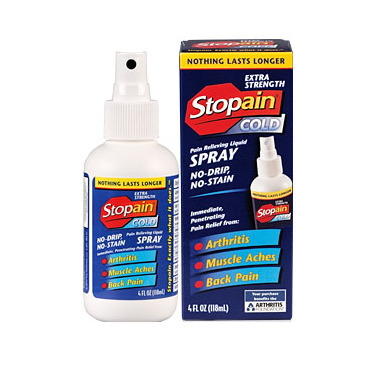 Depend on easy-to-use Stopain Extra Strength Spray for pain relief right where you need it most. Inactive Ingredients: citric acid, dimethylsulfone (MSM), eucalyptus oil, glucosamine sulfate, peppermint oil, SD alcohol 39-C, water. Excellent product! Very effective for arthritis, sprains and strains. Am unable to find it in local stores, but am thankful that I can get it through Well.ca. A great alternative to oral analgesics! I found this product quite by accident during one of my travels and now that I can get it quite easily via Well.ca I won't be without it. It's easy to use, no mess, no fuss, and I find that it takes effect immediately and provides relief for a long time. I have recommended it to others who suffer from arthritic pain. Super product! I have been getting this in the states for years and now its in Canada!!! !